Most of the high use screens in Abtrac are data entry tables (data grids). To customise your Abtrac grid layouts for all users. An administrator can define the visibility, position and width of all available fields from Administration > Settings > User Control Settings. How do I set the number of rows that are displayed for all tables? From the home screen choose > Edit My Settings. Here you can specify the ‘page size’ – that is how many rows are displayed in all tables in Abtrac – just for your login (choose between 10 – 50 rows). I always sort and filter this grid, on this page, this way. Why can’t Abtrac remember how I like it to look? We’re currently working on two options to remember settings for individual users. If it’s not included in User Specific Settings then the page layout you want to save will likely have a Grid Layout option (pictured below). Just filter, group, and sort the grid as required and once you are done choose the Save Grid Layout option. Your current grid changes will be remembered for your particular Abtrac login, for every time you return to that particular page. In order to remove the saved layout choose the undo (Reset Grid Layout) button. Tips for filtering, grouping and sorting Abtrac data. Click on a header to sort by a particular column. A black arrow will then display to indicate the sort order. Click again to reverse the order (eg. A to Z, or Z to A). 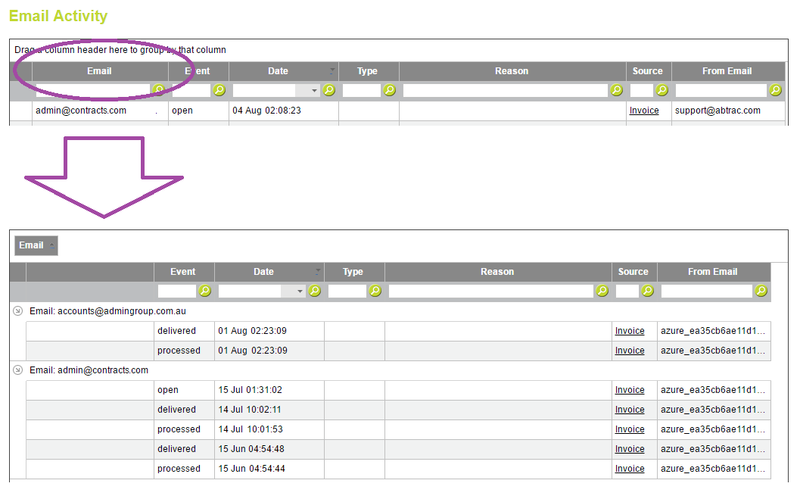 To rearrange the order of columns click and hold a header and drag it across to your preferred location. If your grid has a grouping option (like the Email Management screen) you can drag column headers to group data together. Once grouped you can then choose to expand or hide results for individual groupings. You can filter the results displayed by choosing a drop down option provided. Or you can also specify a specific filter result by typing into the boxes provided. Why can’t I find my data in this grid? I know it exists in Abtrac. Some of the grids in Abtrac have default filters enabled. These are usually screens that can query a large amount of data – check the header rows to view and amend the defaults. If you can’t find what you are looking for the check the current or committed records filters first. Search Clients and Projects – you are initially restricted to Current Clients and Projects only. Load Invoice – only displays current, uncommitted invoices until you amend the filtering. This entry was posted in General, Getting Started, Tips & Tricks and tagged customise, data, filter, grids, page size, rows, search, tables by Jen. Bookmark the permalink.